A former congressman & NFL player, Largent played his entire 14-year career with the Seattle Seahawks. He is outspoken about his Christian faith and helps various charities. Call Christian Speakers 360 at 1.800.966.1380 if you would like to contact a Steve Largent booking agent for a speaking engagement, personal appearance, church function or other faith-based event. Christian Speakers 360 is a Christian talent agency for booking athletes, celebrities, ministers and entertainment. 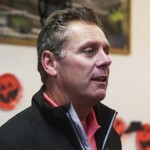 Steve Largent speaks about Christian values. Many of our speakers are born again Christian evangelicals who honor Jesus Christ's message through communities, schools and ministries. For information on Steve Largent's appearance fees, speaking costs and availability, contact Steve Largent's booking agent for details. Largent is a former congressman & NFL player. He played his entire 14-year career with the Seattle Seahawks. He is outspoken about his Christian faith and contributes to various humanitarian causes. He held several all-time receiving records when he retired in 1989. Largent is an outspoken Christian and has demonstrated that faith not only by sharing it verbally, but also by being involved in various humanitarian causes. He has spoken of his faith in Christ as God's Son, who died on the cross for man's sins. The former Congressman has also told how his faith helped him cope with learning that he and his wife's son, Kramer, had spina bifida, a defect which left part of his spinal chord exposed. He said his faith reminded him that God loves Kramer just the way he is. In 2006 he was inducted into the World Sports Humanitarian Hall of Fame in Boise, Idaho. He has been involved with various charities, including: Children's Hospital; Young Life; Fellowship of Christian Athletes; the Salvation Army; Wheelchairs for the World Foundation; Habitat for Humanity; and others. To book Steve Largent for a speaking event or appearance, contact Christian Speakers 360. DISCLAIMER: Christian Speakers 360 does not claim to represent itself as the exclusive agent for Steve Largent. Christian Speakers 360 is a booking agency that represents organizations seeking to hire Christian athletes and celebrities such as Steve Largent for speaking engagements, personal appearances, product endorsements and corporate entertainment. Fees on this website are estimates and are intended only as a guideline. Exact fees are determined by a number of factors, including the location of event, the talent’s schedule, requested duties and supply and demand. Christian Speakers 360 makes no guarantees to the accuracy of information found on this website and does not warrant that any information or representations contained on this website will be accurate or free from errors. We are often asked how can I find out who is Steve Largent's agent? To find Steve Largent appearance fees and booking agent details, you can contact Steve Largent's agent, representative or manager through Christian Speakers 360 for speaking fee costs and availability. Christian Speakers 360 can help your company choose the ideal Christian speaker or entertainer for your next event. To hire Steve Largent for an appearance, speaking event or endorsement, contact Steve Largent's booking agent or rep for more information.